As I was in the middle of composing Friday's post, a brief but fierce summer storm swept through the area, leaving chaos in its wake. 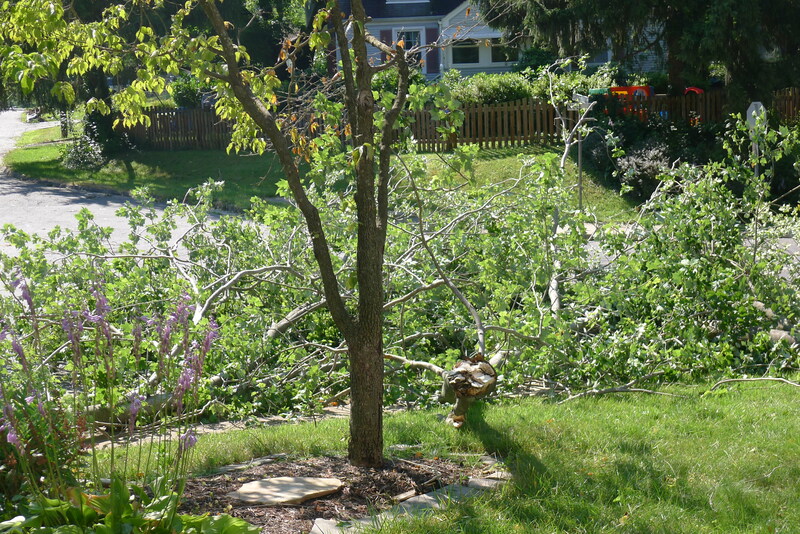 In my own front yard, a large limb came crashing down with enough force to shake the foundations of the basement in my home, where I sat typing at the computer. I rushed up the stairs, fearful of what the crashing sound that I had heard might mean, to find that the house was in one piece, but the tree in our front yard was not. 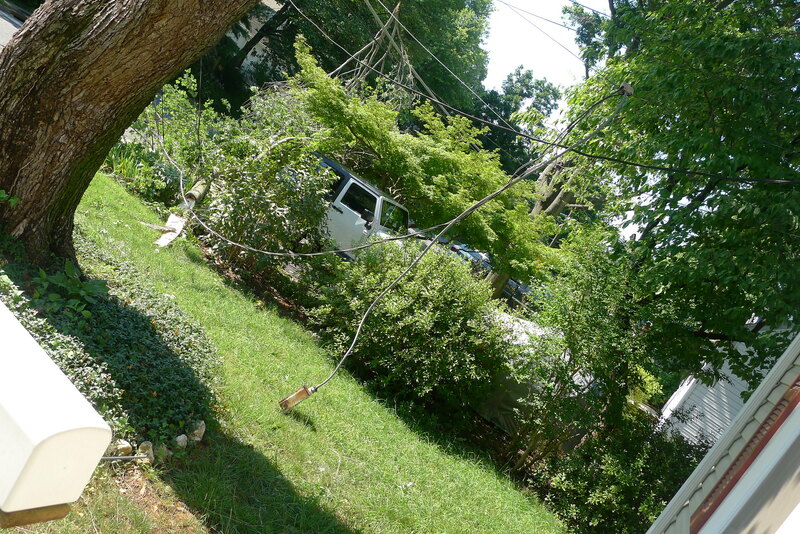 The largest portion had missed the power lines, but landed partway into the street. 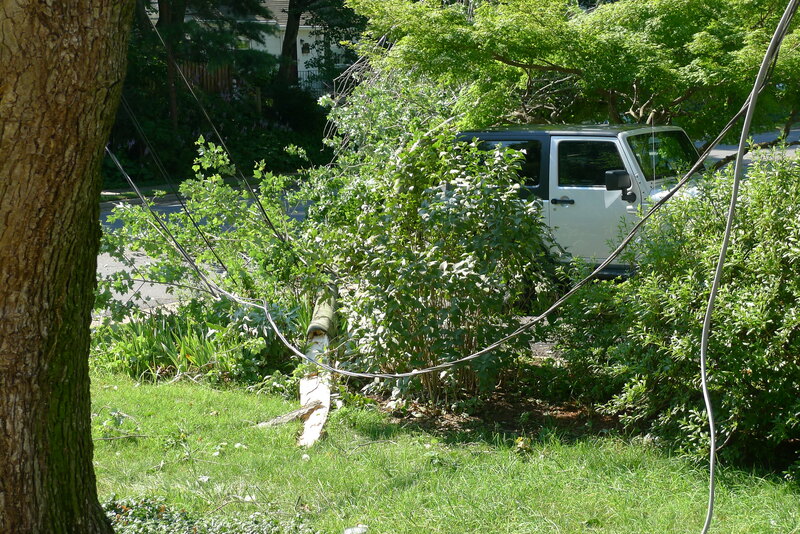 A smaller limb, off to the side, had pulled the lines running from the street back to our own home, and our right-hand neighbor's, down with it as it fell. It also narrowly missed our neighbor's car, parked in his driveway, and ripped the power box right off the side of our house. I was not even aware that it was supposed to rain, let alone storm, and had been eagerly awaiting the arrival of my mother and sister-in-law, who were coming for the weekend to give Tom and me a chance to grab some much-needed rest, and possibly time away from the kids. As I stared out the window at the driving rain and flashing headlights of the cars that carefully swerved to avoid the mess that jutted out from our front lawn, I worried for them, and what kind of conditions they were meeting along the way. They were running much later than initially planned, which Tom and I realized was probably a good thing, considering that their car would have been parked right where that huge limb landed had they arrived on time. They did arrive safely sometime after midnight, and thus began a difficult night for all of us, as the cool air from the dead air conditioning began to dissipate, and the humidity crept in. Tom and I also had not had time to prepare an air mattress or to gather sheets and pillows, so my poor sister-in-law ended up on a makeshift bed consisting of various sized pillows stacked on the basement floor. I worried all night about Michael, who I've been putting to sleep on his tummy out of desperation, but have carefully monitored with a motion-sensitive system that relies on power to function. 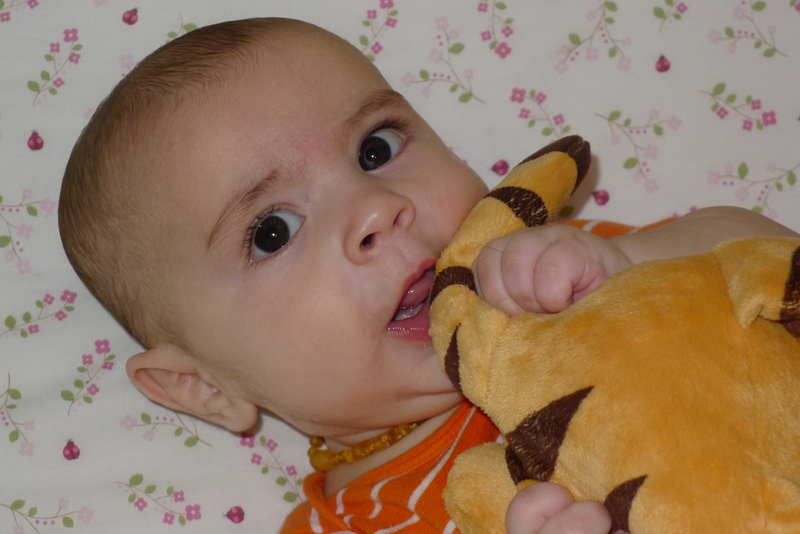 Several times I found myself squinting in the dim light from his bassinet, seeking assurance that his little back was still rising and falling in the gentle rhythms of sleep- assurance that used to come from the silence of the monitor primed to sound an alarm if it should stop. And at some point in the night, when our bedroom began to feel warm even with an open window, I became terrified for Abby, in her cramped attic room. I crept up the stairs and accidentally broke the blinds in her window trying to pull them up, so that I could get the window open for her as quietly as possible. Luckily, despite my clumsiness, she did not awake in the night, and was probably the only occupant of the house to get a good nights' sleep that first evening. In the morning sun, I ran out with my Panasonic and snapped a few pictures of the damage. 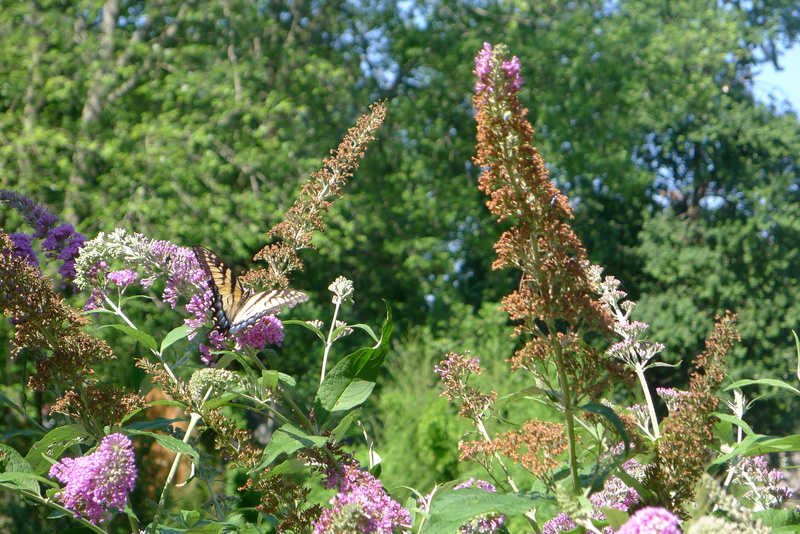 As I headed back to the house, I noticed that the butterflies had started to flock to our "butterfly bush" in the backyard, and I got a nice shot of one. And there's so much more to this story, but I am so terribly behind on sleep, and never seem to have a minute (or a computer) to start these posts until long after I should be in bed. I only hope that I can get the whole story out before Friday, when I definitely need to finish that "flashback" post that I started back when this all began. 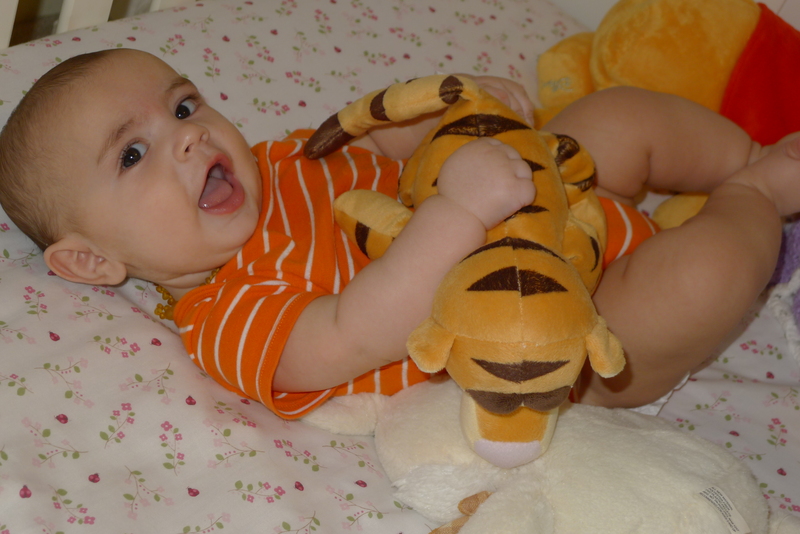 But since I've got them uploaded, I'll go ahead and add a couple more pictures that I took of Michael wrestling with Tigger on Friday afternoon. I only wish I'd had the Nikon on hand for these, as many came out really well except for the lighting, which was terribly dark with just the pop-up flash I had available on the Panasonic. I swear, I've got to find a way to attach my Nikon, and all of its fancy parts, to myself, so that I have it always ready for all of the photo opportunities that crop up during the day. Especially now that we're spread across three levels, I never seem to have a camera handy (or at least, not the one that I really want) when I need it.